he Cannibal Mask comes in One Size Fits Most Adults. 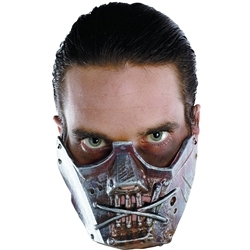 Don this scary mask designed to enclose the mouth of a deranged cannibal. Wearing this alarming mask will turn heads this Halloween. Pair it with a Straight Jacket or Prisoner Costume to complete the look of a Convict, Serial Killer, or Cannibal. Food tastes better when it’s frightened.